Government Approved Shredders by Dahle are all SEG Equipment Guide listed. They have been submitted and tested to meet the requirements by the RCMP for the destruction of Type II / Level 5, Type II / Level 6 and Type IIIA/B destruction. These are for Canada Agencies, Provincial & Federal, Department of Defence and Commercial Business alike - who require High Security Shredding. 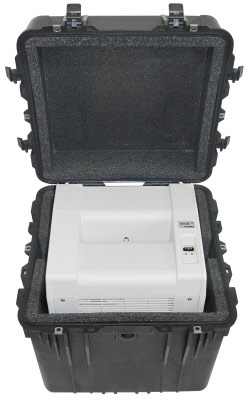 The Type II (Level 6) COMSEC models are listed in the SEG, have been endorsed by the RCMP for High Security Government Approved Shredding and will reduce an 216mm x 279mm (8-1/2” x 11”) piece of paper into 16,000 particles of 1mm x 4.7mm. These government approved shredders are NSA/CSS Specification 02-01 approved which render the pieces to be so small that it is impossible to re-assemble any document you shred with these machines and recommended for departments requiring a higher level of destruction. 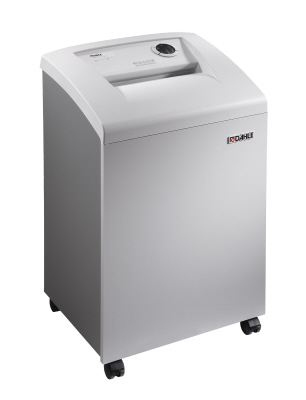 The unique and exclusive SEG listed Type II (Level 6) Deployment Shredder is a must for departments requiring the portability feature of this machine combined with highly sensitive document destruction. Some models are MultiMedia units which give you the ability to shred paper plus: CDs, DVDs, BluRay disks, audio and video cassettes, I.D. badges, floppy disks and much more with NSA/CSS Specification 02-02 & NSA/CSS 04-02 for Optical Media (CD/DVD) Destruction Devices. Automatic Oilers are included as standard on most models now, which will deliver the proper amount of lubrication for optimum performance while preserving the life expectancy of your shredder. Dahle accessories include shred bags, shredder oil and shred boxes for use with your shredder. 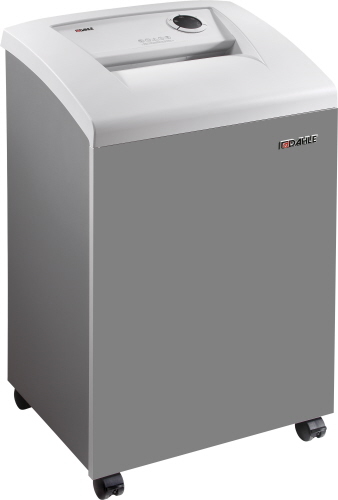 The Dahle 40430 is a shredder cutting cylinder is encased in an all-steel frame and sits on rubber shock mounts. It’s this design that reduces vibration through the cabinet and provides whisper quiet operation. 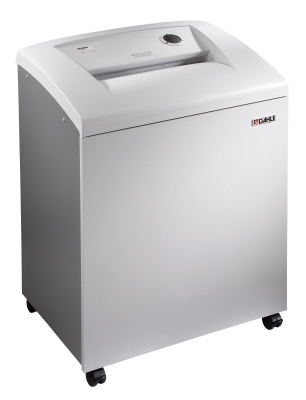 The Dahle 40330 is a RCMP / Canada Government Approved cross cut high security document paper shredder. Any business or government of Canada office can use this for paper sheet and document destruction (up to 8* sheets per feed). This model does not accept other material including staples and paper clips because of the fine shredding process. But it provide the highest level of data destruction, identity and theft protection for the shredded waste. The Dahle 41322 CleanTEC paper shredder is a government approved small office model with Type IIIA (Protected B, Confidential) cross cut security shred format. This model has been RCMP tested and approved for Canadian document destruction standards. It is also listed in the SEG (Security Equipment Guide) for Canada. Dahle's 50464 can easily shred both letter and legal size paper and Optical Media (CD's, DVD's, BluRay Disks) with ease. It offers automatic on/off, continuous run for higher large office and small departmental document destruction volumes of 1,000 to 1,500 sheets per day. Like all Matrix High Performance (MHP) Series shredders, the Dahle 50464 is equipped with the revolutionary SmartPower Energy Management. This model is RCMP rated and approved for Government of Canada use. Security RCMP - Type IIIB / Level 3 (Protected A & B, Confidential), Paper + Optical Media (CD's, DVD's, BluRay Disks). The Dahle 40334 is a RCMP / Canada Government Approved cross cut high security document paper shredder with a 1 mm x 4.7 mm shred format. Any business or government of Canada office can use this for paper sheet and document destruction (up to 8* sheets per feed). The Dahle 41422 CleanTEC model is a government approved office paper shredder with Type IIIA MultiMedia capabilities for destroying documents (with staples or paper clips), Credit Cards, CD's and DVD's. 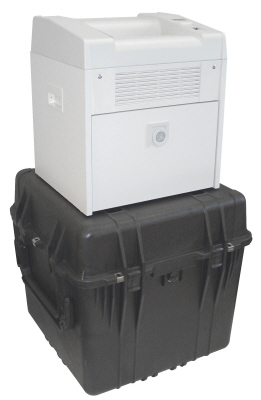 RCMP tested and rated, this model provides for Type IIIA / Level 4 security destruction of media and paper. The Dahle 41334 is a High Security Government Approved paper shredder with Type II / Level 6 shred security (1mm x 4.7mm Cross Cut). The shred size of this unit exceeds the RCMP Destruction Standard and provides a higher degree of security. With the Dahle 41522 cross cut Government Approved Shredder, you can shred paper and multimedia matter quickly and securely. This model meets Canada RCMP tested rating for Type IIIA multimedia and paper shredding standards. 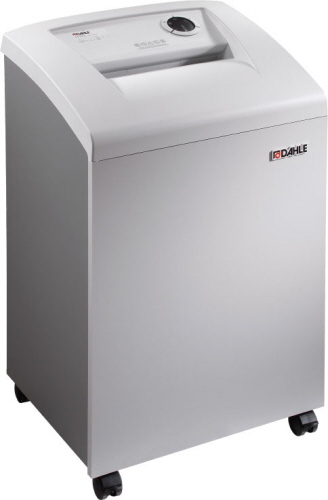 During transit the Dahle 20434 DXC Transportable Type II / Level 6 shredder is protected by foam padding and an airtight / watertight to prevent damage and corrosion. This cross cut model is lightweight and portable. Moving the Dahle 20434 DXC Deployment Security Cross Cut Shredder machine from one place to another couldn't be easier! With a high security paper shredder rating, the Dahle 40434 provides the highest level of document destruction for your office. The cross cut format reduces sheets to 1 mm x 4.7 mm sized waste particles. 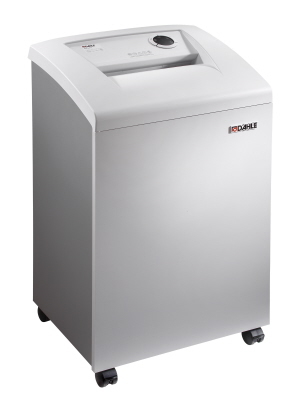 This Dahle shredder is meant for paper document destruction only. The ultra fine cutting cylinder head includes an automatically oiler - to help extend the life of the cutting shafts. 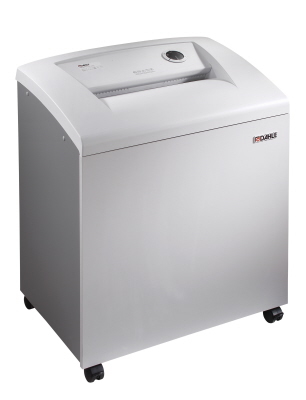 The Dahle 41434 CleanTEC is a Type II / Level 6 high security government approved paper shredder for Canada. This model offers a large waste capacity bin at 30 Gal. and can be easily moved from location with-in an office or department. The Dahle 41622 is a Type IIIA (Top Secret) RCMP rated / Government Approved Shredder designed for paper shredding and CD / DVD destruction. The Dahle 41622 has multimedia and document destruction capabilities for large office and department high volume tasks. The Dahle 20394 is a Government Approved paper shredder with cross cut Type II (Level 6) security which exceeds the security and performance standard of the RCMP Destruction Standards. 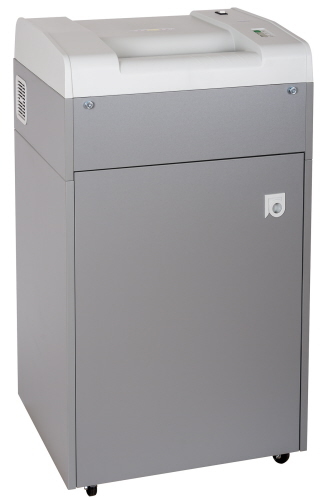 These commercial shredders have been security level compliant tested and are listed on the RCMP Security Equipment Guide (SEG) to meet all the requirements of the approved Canadian Physical Property Destruction Standards.